For your special day, why settle for less than perfect. We offer a variety of modern contemporary cakes, classic tiered cakes, elegant & decadent cakes – anything to turn your wedding cake dreams and fantasies into reality. Wedding cake prices: It is difficult to keep a price list due to the nature of wedding cakes, decoration, flavour of cake to use, etc. – please forward an email to request a quotation. 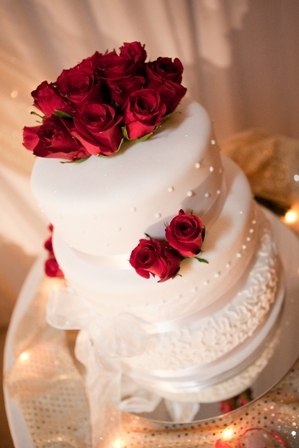 When should I order my wedding cake: As soon as possible! We get booked up well in advance, so as soon as you have the basic preliminary details finalized (how many people, and when/where your event is going to be), please contact us. We only create a limited number of cakes per week as this enables us to devote the necessary attention to detail. All fruit cake orders to be placed at least 3 months before the event to allow it to mature properly to extend the shelf life. Design of cake: We welcome any pictures or photos that you have, as well as any ideas that you would like to discuss with us. If you choose to order a cake from a picture or photo that is not from our portfolio we cannot guarantee that it will be an exact replica, as many pictures are from overseas companies, using equipment that is not available in our local area. We have our own styles and techniques so by paying your deposit you are accepting that we will use our creative discretion to design your dream wedding cake. What price to expect: Every cake is different and it is not feasible to give an exact price without knowing all the details such as design, flavour, size, fillings and icings to be used. Naturally, a large, intricate cake is going to cost you more than a small, simple cake. Sculpted or shaped cakes are priced on a case-by-case basis. All cakes available in Fruit, Vanilla/Chocolate Sponge, Red velvet or Carrot Cake. For the topping, we can do Royal Icing, Pettinice/Sugar Paste, or Chocolate Shavings or Slabs. Various filling options are available.